We covered Qora & Shai’s Arabesque print earlier in the week, but didn’t mention the other eye-catching piece of artwork in their new collection – Something For Cat. 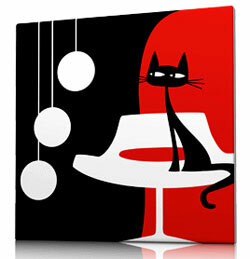 This 60s-style artwork has that Shag-style cat again (although the look probably pre-dates him too), along with a smart space age chair, light fitting and some bold colours. In fact, it’s available in two strong colour schemes, both printed onto canvas, then stretched onto a wood frame. It’s ready for hanging and treated to protect from the sunlight. A 32 x 32 inch print retails for 140 Euros and a 40 x 40 inch sells for 180 Euros.